Our first annual conference will take place in Szentendre, one hour from Budapest, Hungary on 24th May 2017. We warmly welcome anyone who is interested in air pollution, citizen engagement, carbon emissions and the future of our cities. The conference is free to attend, and individuals, NGOs, local organisations, and representatives of local, national or international authorities are all be welcome to join us. 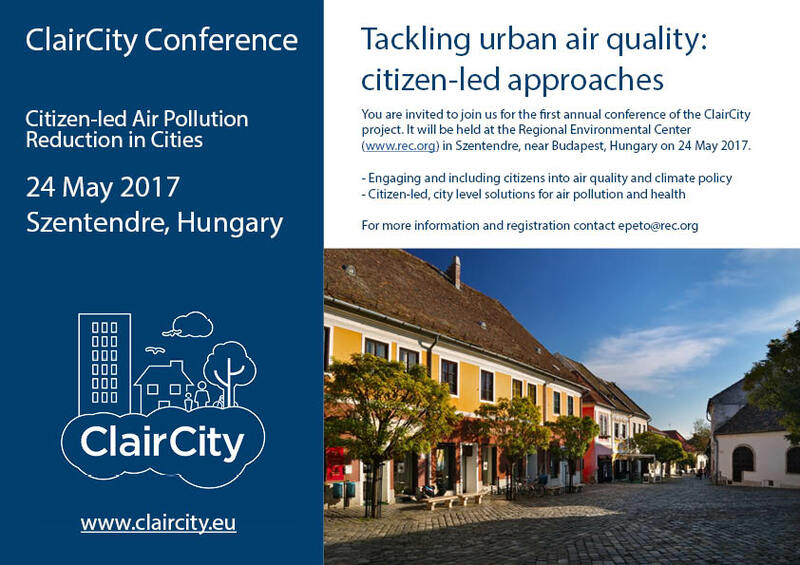 Our conference theme for 2017 is “Tackling urban air quality: citizen-led approaches.” We have a range of speakers from the ClairCity project, as well as our Advisory Panel and external invited guests. Over the course of the day, we will consider the issues of air quality and how these relate to climate change and public health. In this first conference, we are focusing our attention on the practical implications of current research on behavioural change related to environmental and social issues, and public engagement. Through the lectures and time allocated to discussion and response, this conference is a space to deliberate the future vision for air quality, climate change and public health. Please see our draft agenda for more details. Szentendre is a beautiful town in Hungary, easily accessible from Budapest just one hour away. On the registration form you will find hotel and logistical information. This project has received funding from the European Union’s Horizon 2020 research and innovation programme under grant agreement No. 689289.